While looking up ways to get healthy and information on dietary supplements I came across a shocking and unfamiliar topic. Cayenne pepper pills have been shown to have multiple health benefits such as lowering blood pressure, increasing metabolism, and aiding in weight loss. I was very intrigued by this pepper that amazingly has all of these health benefits. Since I had been influenced to get healthy, I wondered, how does cayenne pepper affect metabolism and aid in weight loss? So I started researching the topic and my first question was, what exactly is it in cayenne pepper that makes this effect? The answer was found in an article by Opheim and Rankin which stated “Capsaicin (CAP), 8-methyl-N-vanillyl-6-nonenamide (C18H27NO3), is the major active component of hot peppers (genus Capsicum, Solanaceae)”. According to the link, repeated intake of CH-19 pepper showed reduced body weight and suppression of fat in subjects. This was shocking news for me and I was intrigued to find out more. Some basic questions I thought about were how exactly did the cayenne pepper aid in weight loss and what data did they use to support their results? So I searched on, trying to find how exactly this works. After multiple failed attempts at searching “cayenne pepper” I got smart and used “capsaicin” which yielded a ton more efficient results. Noticing that not all of the articles were what I was looking for I added metabolism to the key words. The first article I came across an article titled Effects of capsinoid ingestion on energy expenditure and lipid oxidation at rest and during exercise that was published in 2010. Finding that the article failed to prove any relevant results, I used its citations to find a very relevant article titled Effects of CH-19 Sweet, a non-pungent cultivar of red pepper, in decreasing the body weight and suppressing body fat accumulation by sympathetic nerve activation in humans that was published in April 2006. After reading over and deciding that this paper was not only sufficient to answer my questions but it was also interesting enough for me to write about. It was important to note that the total intake of CH-19 sweet pepper ingested each day was 0.4g per kg of standard weight. They ingested the pepper both uncooked and frozen. The paper indicated that the subjects were measured on a digital scale and weighed three times a day once before each meal. They then averaged the three weights and that gave the weight per day. According to the paper, the CH-19 pepper group weight started to decrease right after treatment and significantly decreased compared to the control group on day three. 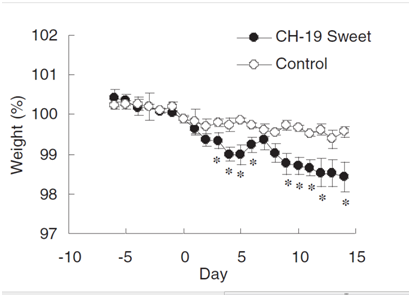 This data is shown below in Figure 1 where it is obvious that the CH-19 group weight had decreased more significantly. The * included in the graph denotes the days that had more significant difference between the two groups. Although it was obvious that the CH-19 group had dropped weight, the paper also said that the control group had a weight decrease of 0.4% during the treatment period. I wondered if there was a difference in caloric intake which could have implemented the weight loss so I looked into the paper more. The paper indicated that they adjusted each subjects’ caloric intake per day in order to keep their weight the same in both groups. They monitored their eating patterns and to reduce stress allowed the subjects to eat a variety of foods that they enjoy. I also found it interesting that they excluded female subjects from this study due to their menstrual cycle. Next I questioned whether or not the weight loss was simply water weight or something more. This led me to Figure 2 which summarizes the changes in fat percentage between both groups during the two-week treatment period. According to the literature, the body weight and BMI changes in the control group were minimal, the body fat mass and body fat percentage were increased. I wasn’t sure what was mean by minimal so I referred back to the paper and found a figure referring to the control group’s body weight and BMI. It is clear in the table that the fat mass and body fat percentage increased and it was then obvious that there was very little of a difference in the body weight and BMI. The paper also stated that CH-19 group’s body weight, BMI and fat mass overall decreased. However, the statement that the BMI decreased overall was contradicting to me because this ‘decrease’ seemed equivalent to the ‘minimal’ case of the control group. On the other hand, with all of the data provided I was a believer. 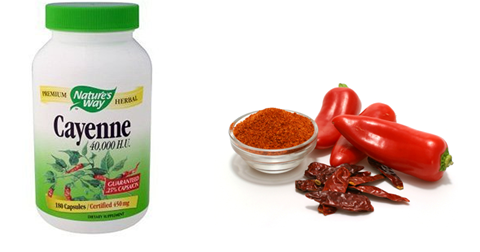 The capsaicin in cayenne pepper is having some kind of impact on metabolism and weight loss. The data was now supported, but my next question was, how exactly does this work? I searched plenty of articles trying to find a reason for this and instead learned that the mechanism of capsaicin and what organs it affects is not very well understood. That led me to the paper’s citations where I found a paper that explained the effects of Capsaicin on metabolism and oxidation. cayenne pepper that results in these metabolic effects. However, it was proven in this article that “pungency itself is not involved in the various physiological effects of capsaicin”. Therefore, I decided that this paper was useful because it explored the effects of capsaicin on energy metabolism in mice. To do this, they measured oxidation consumption, serum components and weight in mice. First I was interested in how exactly this was done. How did they administer the capsaicin and how much? I found the answer in the methods part of the paper which told me that the mice were given either the vehicle (control) or capsaicin through a stomach tube. 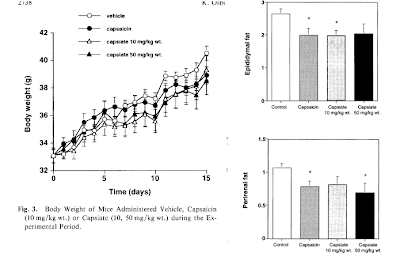 The amount of capsiate or capsaicin was given according to 10mg/kg of the mice body weight. Next I was interested in what they had discovered. Figures 1&2: Oxygen Consumption and Serum levels in mice. This next figure explained the affects that capsaicin and capsinoid-like substance capsiate had on energy metabolism in mice. Figure 1 gives us a clear representation that oxygen consumption levels are much higher in capsaicin and capsiate levels than in the control group. The paper noted that the major significance was between 30-60 minutes after administration of the capsaicin. The effects were greatest about two hours after administration for capsiate. How was this done? The mice were separated into chambers depending upon body weight and an instrument measured their respiratory gas. In short, room air was pumped into this chamber and expired air was let out into a gas analyzer. This was shocking to me that with only one dose of capsaicin, the rate of oxygen consumption jumped. Figure 2 represents the concentration of various serum components in the mice. Once again, it is obvious that the capsiate and capsaicin groups have a significant increase in levels compared to the control group. We know adrenaline to have effects on our sympathetic nervous system such as increase heart rate, and dilate air passages. This is consistent with the data that the capsaicin and capsiate increase oxygen consumption furthermore, affecting metabolism. Figure 2 also shows levels of triglycerides, free fatty acids, and glucose in the serum. Like adrenaline, the glucose and free fatty acid serum levels were increased in the capsaicin and capsiate mice groups. 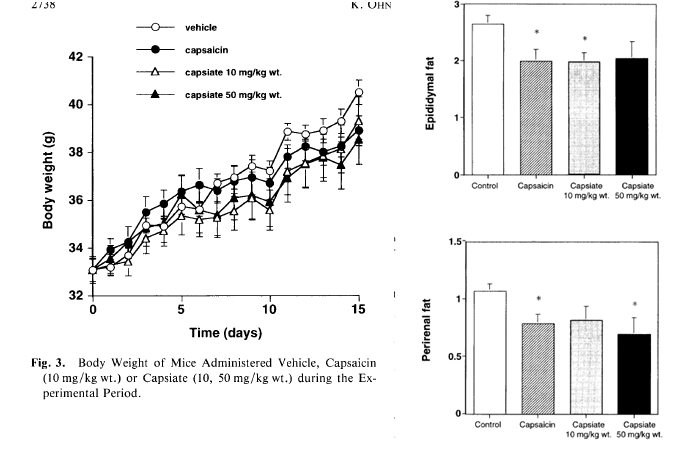 On the other hand, the triglyceride levels were decreased in mice serum with capsaicin and capsiate activity. So, how is this all related to the weight loss and metabolism? This led me to more data on weight loss. Just like the observed report in the primary literature discussed above, capsaicin has affect on weight loss and fat accumulation. In this part of the experiment, capsaicin and capsiate were given for two week administration periods. Food and water intake was not altered between the three groups of mice. Figure 4A shows the accumulation of white adipose tissue in the mice. The accumulation as diminished in both capsaicin and capsiate administered mice as seen in the graph above. 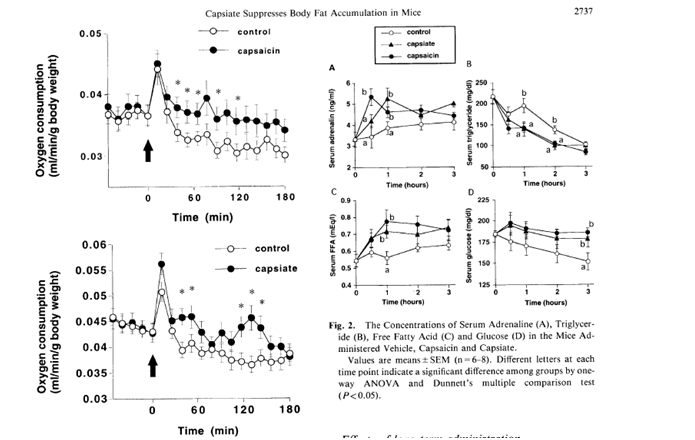 This is also obvious from figure 4B that the body fat accumulation was suppressed in the two groups of mice. Because this paper was comparing the effects of both capsaicin and capsiate, they concluded that there was no significant difference between these two groups of mice and they both gave the same results. However, there were differences in timing but they concluded that could be the result of absorption properties. Overall I have observed many articles and sources of data applying to the affects of capsaicin, a component of the cayenne pepper, on weight and metabolism. It is clear that there is still a lot of research to be done on the topic in order to better understand the mechanism of the component and well as what organs and systems are involved. Although the mechanics are still vague, I was able to comprehend the comparison between the cayenne pepper and the building blocks of organic chemistry. I love your topic. As someone who, on occasion, has eaten chili peppers for breakfast, I felt compelled to read your post. After reading it over, I was surprised to see that capsaicin increases plasma glucose and free fatty acid levels. Does it do that by increasing absorption from food, or by somehow decreasing cellular uptake of glucose? I would think the former, but I’m not quite sure how that fits into the whole weight loss aspect. Does it also affect insulin? I’m not sure I’m convinced yet, but I really hope this is true as it would help justify my eating habits. I’m definitely going to keep an eye out for more research into this. I have seen many uses for capsaicin and have always wondered how this worked. The fact that it increases lipid and overall metabolism is very interesting. I wish I could see more on how exactly this works physiologically besides just the proof of concept. Capsaicin also is used on joints to decrease inflammatory response in arthritis and other pain suffering patients. I would love to see how this works. 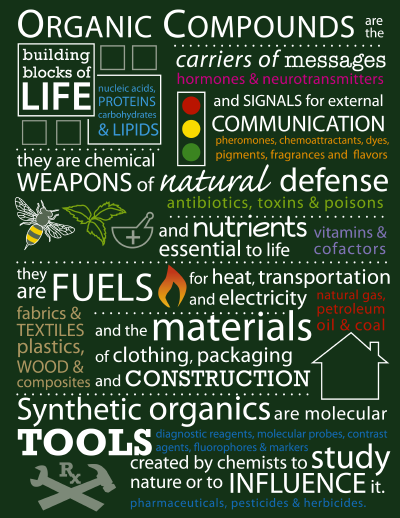 What is it about this chemical that causes the body to respond by upping metabolism and decreasing immune responses? Knowing more about this would be intriguing to learn about.